Remember when Salesforce.com said marketing tech was going to be its next billion-dollar business? That was almost two years ago, and at the time I warned that Salesforce was a little too focused on social media at the expense of email marketing. A year later Salesforce bought ExactTarget for $2.5 billion. These days you’re not an enterprise player if you don’t have a suite of products you’re calling a “marketing cloud.” Adobe, IBM, and Oracle pitch against Salesforce, and HP and SAP have stories to tell, too. Younger companies like IgnitionOne and the DMP dashboard and social and mobile media gang have roles. The problem, as the marketing analytics experts at Efectyv point out, is that “marketing cloud branding obfuscation” across dissimilar products makes the jobs of marketers, merchandisers, and IT guys harder. 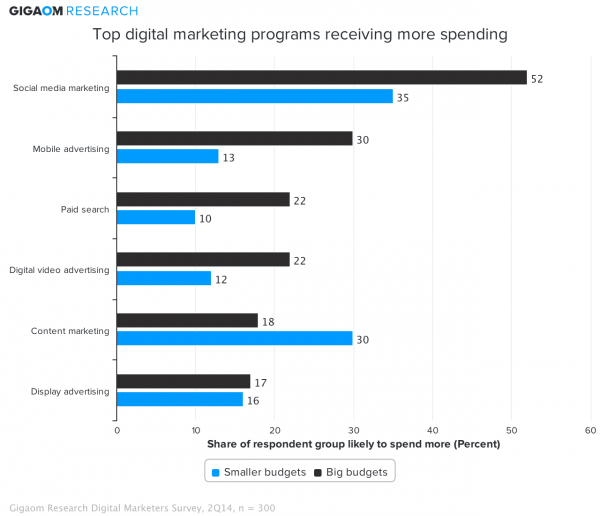 Gigaom Research recently surveyed a few hundred digital marketers to find out their priorities and hot buttons, and to hear which digital marketing tactics they thought were most effective and which needed help. As the charts below illustrate, Salesforce wasn’t wrong in its eagerness to tap into social media. I’ve split out the respondents with million-dollar plus digital marketing budgets from the masses. 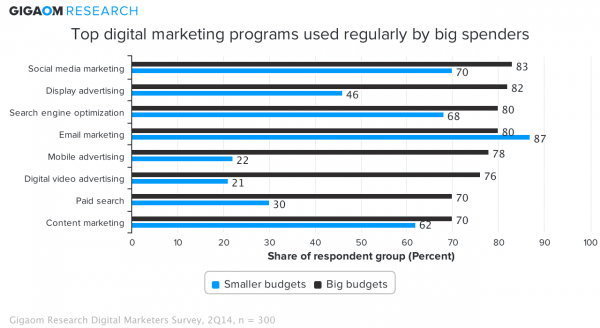 You can see that the vast majority of big spenders use just about every digital tactic. That’s because they’re using digital on all phases of marketing: awareness, acquisition, conversion, and retention. Meanwhile, email and SEO remain the workhorses for smaller guys. But though few of them are doing mobile or digital video yet, they’re all over social media marketing. But it’s the big spenders who are driving social media marketing, as well as mobile and digital video. The chart below shows what portion of each group said they were going to increase spending in any given tactic. Over half of the big spender say their social media budgets are going up, while nearly a third are boosting mobile, and over one fifth are video. It’s apparent that would-be marketing platform providers must tailor their offerings for social media, but if they’re selling to big spenders they must build tools for orchestrating campaigns and programs across digital formats and marketing objectives. And there’s a further twist on social. Our survey also showed that many marketers are crafting social media marketing on faith. Over half of our survey respondents said it was difficult to prove ROI for social media. Gigaom Research is kicking off a Sector Roadmap report on marketing tech platforms. In it, we’ll evaluate the near-term trends that are causing the most disruption – or opportunity – in the space. I invite you to offer your own opinion about what are the most important trends in digital marketing, and which suppliers are positioned to take advantage of them. Spend a few minutes on a short poll. Here are some early thoughts on those trends and market forces. Let me know which ones or others you think are most critical in the next 18 to 24 months. Social – ROI is a problem, and it’s still fundamentally a short-form communications medium. That means unlike TV it’s not easy to interrupt, or to tell stories for branding. Mobile – You can’t track it like online. So far, search and app upgrades work – meaning Google and Facebook get all the spending – and geo-targeted offers seem obvious. But is that all there is? Digital video – It doesn’t really have any reach yet; is multiscreen the best payoff? When will TV be bought programmatically? Search evolution – How long can Google remain the only game that matters? Some say mobile could change things; I’m not so sure. Multichannel – Hey, remember offline, where most of the money is still spent? Privacy backlash – Big Brother is watching. Is there a coming consumer or government smackdown? Direct marketing techniques for brand advertising – Digital media has empowered the direct marketers. When will they exert themselves on far fuzzier branding metrics? Big data – If by “big data” you mean “huge amounts of unstructured data analyzed in real-time,” well, most marketing campaigns aren’t bought and sold that way. Advertising currency – Can you believe digital audience measurement still hasn’t shaken out, and can’t be compared with TV or print yet?